One of the dairy items regularly residing in my refrigerator is low-fat buttermilk. I only buy the quarts and even then I don't always use it all up, but buttermilk is a great addition/substitution for moist and lower fat recipes. I love it in my Texas sheet cake, banana oatmeal snack cake and too good cornbread. For Valentine's day this year I took a nice still a little warm chocolate, cinnamon, buttermilk Texas sheet cake in to work for my lulu valentines. Quick, easy and not as ridiculously fattening as brownies (not hating on brownies, however). I bought a nice little jar of buttermilk ranch spices at Penzey's and use buttermilk and nonfat Greek yogurt to make fresh salad dressing. Buttermilk also works miracles as a brine for chicken. 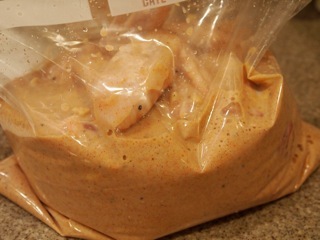 You can let your chicken absorb all the tenderizing, taste-boosting goodness for as little as two hours, but plan ahead and go for twenty four to forty eight hours. Your chicken will be amazing. This recipe is an adaptation of a Nigella Lawson recipe. The roasted chicken will have the layered taste of fried chicken, but without the fat and the mess of frying. It's really good. Buy chicken pieces, a whole chicken cut-up or have your butcher cut up a nice little happy chicken from Whole Foods or your local grocery. Commercial chicken all 'roided up and plumped with a salt solution just does not have the same delicious taste along with it not being good for the planet or you. Watch for sales and stock up if you have a nice freezer. Or just think of it this way, so the good for you and good for the earth chicken is $4.99 a pound. If you are an omnivore, how much do you spend on a good steak? Or just do what I do and buy a whole chicken for $1.99-$2.49 a pound and butterfly it yourself or have the nice butcher cut it up for you. Put on your prettiest smile and make that butcher's day. Be kind and friendly and you will have chicken just how you like it without wrestling with chicken cartilage. 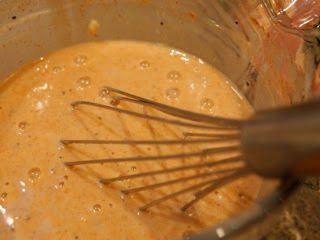 Whisk buttermilk with garlic, salt, sugar, paprika and freshly ground pepper. 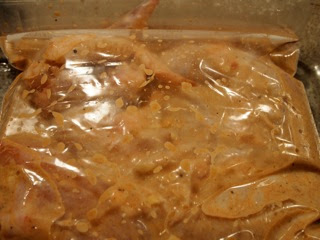 Place chicken in a covered baking dish or gallon ziploc bag and pour buttermilk brine in to cover. Refrigerate for 2-48 hours, the longer the better. 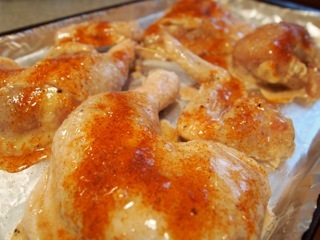 Once or twice rotate chicken a bit to ensure even soaking. 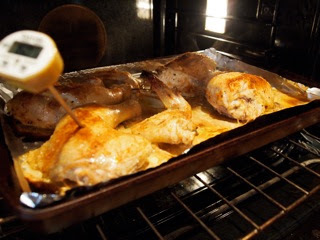 When ready to roast chicken, preheat oven to 425 degrees. Line a shallow baking dish with foil (you don't need to do this, but it does make clean-up super easy). 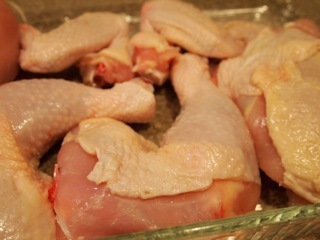 Remove chicken from brine and arrange in baking dish. 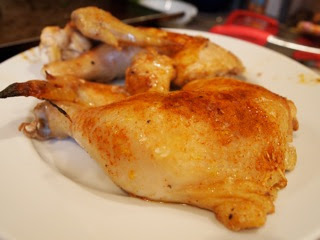 Drizzle chicken lightly with olive oil and sprinkle with additional and paprika. Roast for 30 minutes or so, breasts may take 5-10 minutes longer until instant read thermometer reaches 160 degrees in the thickest parts and the chicken is nice and brown. Serve immediately.